Hongneung, the birthplace of Korean technology and innovation and a center of the nation’s economic growth in the 1960s and 70s, will be transformed into a biomedical R&D hub in mutual cooperation with local residents. 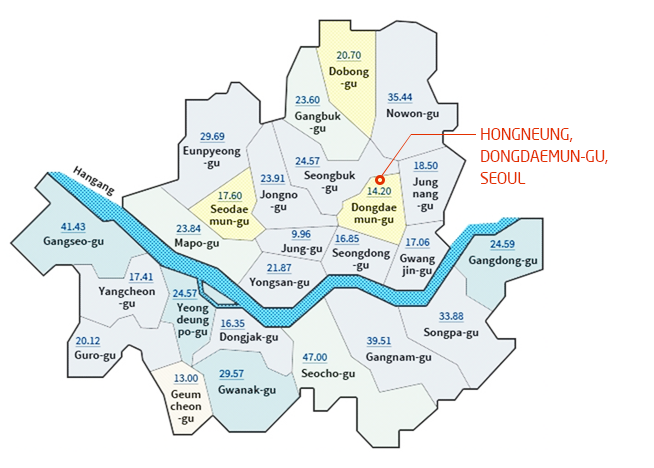 By rejuvenating the Hongneung Complex, the Seoul Metropolitan Government hopes to secure a new engine for balanced growth in northeastern Seoul as well as realize Seoul-style creative economy. On April 1, the Seoul Metropolitan Government announced the Hongneung Research Complex Renewal and Revitalization Plan, which focuses on creating a biomedical R&D cluster, vitalizing the local economy through urban renewal, and sharing the benefits of the plan with local residents. After a number of discussions, the Seoul Metropolitan Government has confirmed the potential of Hongneung as a hub of biomedical R&D and plans to provide its full support. The biomedical industry is poised to become a new growth engine for Korea as demand is expected grow as the population changes, including the aging of the population and increasing number of people suffering from chronic diseases. In particular, two prominent general hospitals, basic research institutions such as KIST and KAIST, which specialize in basic research in biology and medical engineering, as well as the Korea Techno-Venture Foundation, which provides startups with incubation facilities, are all located in Hongneung. As such, it would be easy to create a network among hospitals, research centers, and universities in the area and maximize synergy among them in order to foster the biomedical industry. Through the Hongneung Research Complex Renewal and Revitalization Plan, the Seoul Metropolitan Government plans to establish an R&D cluster in Hongneung in three phases: Dot (Biomedical R&D base), Line (Biomedical R&D street), and Area (Biomedical R&D cluster). The government hopes that this cluster will serve as a solid foundation for balanced growth in northeastern Seoul, thereby realizing a Seoul-style creative economy. First, the Korea Rural Economic Institute (KREI), which was acquired by the Seoul Metropolitan Government, will become the “Biomedical R&D Base” by 2016. It will serve as a space for R&D with a focus on openness and innovation. As such, the KREI will concentrate on providing R&D support for the transfer of translational research and technology, business management support for patents, venture capital, legal assistance, and accounting services, as well as on fostering professionals by offering education on IR (Investor Relations), technology transfer, and business startups. Companies that choose to set up shop in the KREI will receive support to grow into leading companies in the biomedical sector. Specifically, companies will be provided incentives for moving into the KREI, such as reduced rent and connections to Seoul-style R&D projects. The Seoul Metropolitan Government will also provide practical assistance, such as the shared use of research equipment and support for technology commercialization by signing MOUs regarding marketing companies, legal counselors, biomedical funds, and related research institutions. In the first half of 2016, the government will begin receiving applications from companies wishing to rent spaces in the KREI. Starting in 2017, the Seoul Metropolitan Government will begin building a “Biomedical R&D Street” along Hoegi-ro and actively attract outstanding companies and foreign research centers in related fields. At first, the government will begin with the available spaces in the KREI and gradually develop and expand the street from there. Moreover, in line with the central government’s plan to build a “Global Creative-Knowledge Science Culture Complex,” the Seoul Metropolitan Government will help the region develop into a creative economy hub. Finally, by establishing a network between KIST, KAIST, Korea University Hospital, and Kyung Hee University Hospital in the long term, the Seoul Metropolitan Government plans to create a biomedical cluster where industry, education, technology, and personnel can all come together. The government will support the Hongneung Research Complex so that it may work with universities and hospitals to advance basic research technology, carry out clinical trials, and commercialize processes and products, thereby creating a virtuous cycle within the biomedical R&D sector. Details regarding the phases of the plan will be specified by the government through discussions with related organizations and expert counseling sessions. Furthermore, the Seoul Metropolitan Government will work to ensure that the Hongneung research complex grows together with the local community through its plan to designate some spaces in the KREI for use by the local community, increase public access to Hongneung Forest, and focus on urban renewal in the surrounding areas. To this end, the Seoul Metropolitan Government plans to hold town hall meetings and public hearings in the first half of this year to gather public opinion and come to an agreement regarding the development of the area with the local community.